Here’s an updated version ofMustang’s popular Fastback series, the all-new HighTail Fastback. 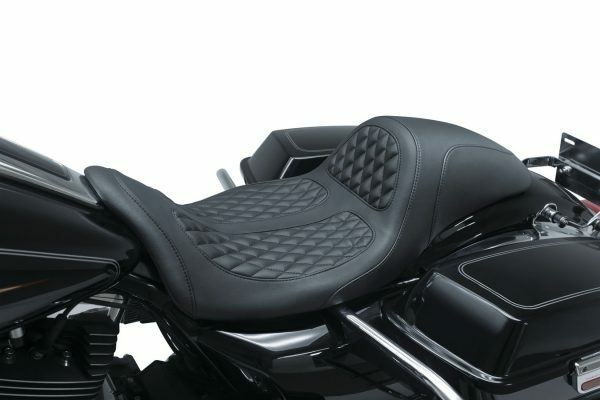 It features all the comfort that put Mustang on the map in a sporty, low profile package that positions riders lower and 1” further back than the original. Available for 2006-’17 Dyna and 2008-’19 Touring models, the HighTail provides a comfortable but aggressive riding position that allows riders to get the most out of their machines. 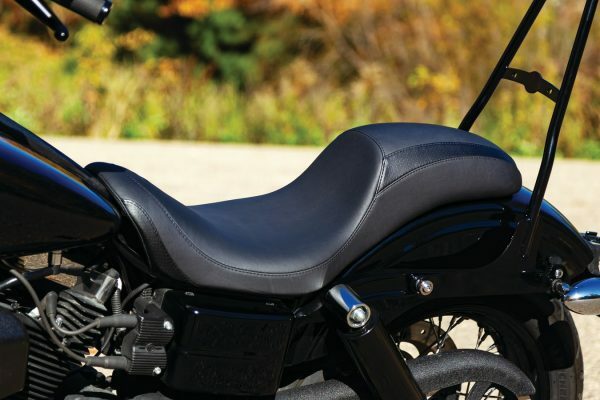 The HighTail’s signature 6” high wall offers exceptional lower back support and keeps riders from sliding back in the saddle, making it perfect for aggressively twisting back the throttle or casually feasting on mile markers. A contoured and low-profile 13.5” wide driver bucket positions the operator lower and further back compared to most stock seats, while Mustang’s proprietary controlled-density foam provides even weight distribution to eliminate pressure points for long-haul comfort. The hand-sewn cover is made from premium expanded vinyl that has the appearance of leather and durability to withstand the elements. Features include detailed stitch work and a blend of smooth vinyl with perforated vinyl inlays for a subtle contrasting effect. Additionally, Mustang’s Custom Seat Program offers a wide variety of stitch patterns as well as thread and vinyl color variations to create your own one-of-a-kind design. The HighTail for 2008-’19 H-D Touring is also available as part of the Dave Perewitz Signature Series by Mustang, which features classic diamond-stitched panels for added style.For more information on the new HighTail offerings, visit www.MustangSeats.com or call to speak with a Mustang representative at 800-243-1392 or 413-668-1100 to learn more about custom seat options.